I've read this answer, reducing boilerplate, looked at few GitHub examples and even tried redux a little bit (todo apps). Why you should use Redux over Facebook Flux? Is that only a question of programming styles: functional vs non-functional? Or the question is in abilities/dev-tools that follow from redux approach? Maybe scaling? Or testing? Am I right if I say that redux is a flux for people who come from functional languages? To answer this question you may compare the complexity of implementation redux's motivation points on flux vs redux. Redux is not that different from Flux. Overall it has same architecture, but Redux is able to cut some complexity corners by using functional composition where Flux uses callback registration. There is not a fundamental difference in Redux, but I find it makes certain abstractions easier, or at least possible to implement, that would be hard or impossible to implement in Flux. Take, for example, pagination. My Flux + React Router example handles pagination, but the code for that is awful. One of the reasons it's awful is that Flux makes it unnatural to reuse functionality across stores. If two stores need to handle pagination in response to different actions, they either need to inherit from a common base store (bad! you're locking yourself into a particular design when you use inheritance), or call an externally defined function from within the event handler, which will need to somehow operate on the Flux store's private state. The whole thing is messy (although definitely in the realm of possible). On the other hand, with Redux pagination is natural thanks to reducer composition. It's reducers all the way down, so you can write a reducer factory that generates pagination reducers and then use it in your reducer tree. The key to why it's so easy is because in Flux, stores are flat, but in Redux, reducers can be nested via functional composition, just like React components can be nested. This pattern also enables wonderful features like no-user-code undo/redo. Can you imagine plugging Undo/Redo into a Flux app being two lines of code? Hardly. With Redux, it is—again, thanks to reducer composition pattern. I need to highlight there's nothing new about it—this is the pattern pioneered and described in detail in Elm Architecture which was itself influenced by Flux. People have been rendering on the server fine with Flux, but seeing that we have 20 Flux libraries each attempting to make server rendering “easier”, perhaps Flux has some rough edges on the server. The truth is Facebook doesn't do much server rendering, so they haven't been very concerned about it, and rely on the ecosystem to make it easier. In traditional Flux, stores are singletons. This means it's hard to separate the data for different requests on the server. Not impossible, but hard. This is why most Flux libraries (as well as the new Flux Utils) now suggest you use classes instead of singletons, so you can instantiate stores per request. If stores are classes, how do I create and destroy them with dispatcher per request? When do I register stores? How do I hydrate the data from the stores and later rehydrate it on the client? Do I need to implement special methods for this? Admittedly Flux frameworks (not vanilla Flux) have solutions to these problems, but I find them overcomplicated. For example, Flummox asks you to implement serialize() and deserialize() in your stores. Alt solves this nicer by providing takeSnapshot() that automatically serializes your state in a JSON tree. Redux just goes further: since there is just a single store (managed by many reducers), you don't need any special API to manage the (re)hydration. You don't need to “flush” or “hydrate” stores—there's just a single store, and you can read its current state, or create a new store with a new state. Each request gets a separate store instance. Read more about server rendering with Redux. Again, this is a case of something possible both in Flux and Redux, but Flux libraries solve this problem by introducing a ton of API and conventions, and Redux doesn't even have to solve it because it doesn't have that problem in the first place thanks to conceptual simplicity. I didn't actually intend Redux to become a popular Flux library—I wrote it as I was working on my ReactEurope talk on hot reloading with time travel. I had one main objective: make it possible to change reducer code on the fly or even “change the past” by crossing out actions, and see the state being recalculated. I haven't seen a single Flux library that is able to do this. React Hot Loader also doesn't let you do this—in fact it breaks if you edit Flux stores because it doesn't know what to do with them. When Redux needs to reload the reducer code, it calls replaceReducer(), and the app runs with the new code. In Flux, data and functions are entangled in Flux stores, so you can't “just replace the functions”. Moreover, you'd have to somehow re-register the new versions with the Dispatcher—something Redux doesn't even have. Redux has a rich and fast-growing ecosystem. This is because it provides a few extension points such as middleware. It was designed with use cases such as logging, support for Promises, Observables, routing, immutability dev checks, persistence, etc, in mind. Not all of these will turn out to be useful, but it's nice to have access to a set of tools that can be easily combined to work together. 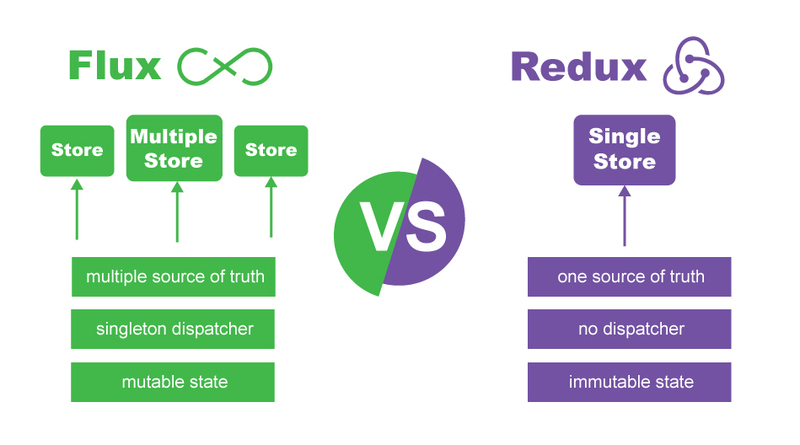 Redux preserves all the benefits of Flux (recording and replaying of actions, unidirectional data flow, dependent mutations) and adds new benefits (easy undo-redo, hot reloading) without introducing Dispatcher and store registration. Keeping it simple is important because it keeps you sane while you implement higher-level abstractions. Unlike most Flux libraries, Redux API surface is tiny. If you remove the developer warnings, comments, and sanity checks, it's 99 lines. There is no tricky async code to debug. You can actually read it and understand all of Redux. See also my answer on downsides of using Redux compared to Flux. First of all, it is totally possible to write apps with React without Flux. But if you still interested knowing more, read on. I believe you should start with pure React, then learn Redux and Flux. After you will have some REAL experience with React, you will see whether Redux is helpful for you or not. Maybe you will feel that Redux is exactly for your app and maybe you will find out, that Redux is trying to solve a problem you are not really experiencing. If you start directly with Redux, you may end up with over-engineered code, code harder to maintain and with even more bugs and than without Redux. Managing this ever-changing state is hard. If a model can update another model, then a view can update a model, which updates another model, and this, in turn, might cause another view to update. At some point, you no longer understand what happens in your app as you have lost control over the when, why, and how of its state. When a system is opaque and non-deterministic, it's hard to reproduce bugs or add new features. As if this wasn't bad enough, consider the new requirements becoming common in front-end product development. As developers, we are expected to handle optimistic updates, server-side rendering, fetching data before performing route transitions, and so on. We find ourselves trying to manage a complexity that we have never had to deal with before, and we inevitably ask the question: Is it time to give up? The answer is No. This complexity is difficult to handle as we're mixing two concepts that are very hard for the human mind to reason about: mutation and asynchronicity. I call them Mentos and Coke. Both can be great when separated, but together they create a mess. Libraries like React attempt to solve this problem in the view layer by removing both asynchrony and direct DOM manipulation. However, managing the state of your data is left up to you. This is where Redux comes in. Following in the footsteps of Flux, CQRS, and Event Sourcing, Redux attempts to make state mutations predictable by imposing certain restrictions on how and when updates can happen. These restrictions are reflected in the three principles of Redux. Redux itself is very simple. This object is like a "model" except that there are no setters. This is so that different parts of the code can’t change the state arbitrarily, causing hard-to-reproduce bugs. Secondly that motivations page you link to does not really discuss the motivations of Redux so much as the motivations behind Flux (and React). The Three Principles is more Redux specific though still does not deal with the implementation differences from the standard Flux architecture. Basically, Flux has multiple stores that compute state change in response to UI/API interactions with components and broadcast these changes as events that components can subscribe to. In Redux, there is only one store that every component subscribes to. IMO it feels at least like Redux further simplifies and unifies the flow of data by unifying (or reducing, as Redux would say) the flow of data back to the components - whereas Flux concentrates on unifying the other side of the data flow - view to model. I'm an early adopter and implemented a mid-large single page application using the Facebook Flux library. As I'm a little late to the conversation I'll just point out that despite my best hopes Facebook seem to consider their Flux implementation to be a proof of concept and it has never received the attention it deserves. I'd encourage you to play with it, as it exposes more of the inner working of the Flux architecture which is quite educational, but at the same time it does not provide many of the benefits that libraries like Redux provide (which aren't that important for small projects, but become very valuable for bigger ones). I worked quite a long time with Flux and now quite a long time using Redux. As Dan pointed out both architectures are not so different. The thing is that Redux makes the things simpler and cleaner. It teaches you a couple of things on top of Flux. Like for example Flux is a perfect example of one-direction data flow. Separation of concerns where we have data, its manipulations and view layer separated. In Redux we have the same things but we also learn about immutability and pure functions. After sliding backward down the redux learning curve I had the same question and thought pure flux would be simpler like OP. I soon saw the benefits of redux over flux as noted in the answers above, and was working it into my first app. While getting a grip on the boiler plate again, I tried out a few of the other state management libs, the best I found was rematch. It was much more intuitive then vanilla redux, it cuts out 90% of the boilerplate and cut out 75% of the time I was spending on redux (something I think a library should be doing), I was able to get a couple enterprise apps going right away. It also runs with the same redux tooling. This is a good article that covers some of the benefits. So for anyone else who arrived to this SO post searching "simpler redux", I recommend trying it out as a simple alternative to redux with all the benefits and 1/4 of the boilerplate. You better use MobX to manage the data in your app to get better performance, not Redux. React Redux: How to share data between reducers? When to use Flux (etc.) with React? Is it sane to use React `context` to access model mutators in a Flux-less app? Why use Redux-Observable over Redux-Saga?